If you’re in Gilchrist County, make a point of stopping for breakfast or lunch at The Cracker Box restaurant in Trenton. They’re located just off Hwy 26, just west of US129 in an old house. They serve great breakfasts and lunch, 7 days a week (open at 6AM, close at 2PM). When it comes to breakfast, my benchmark is always pancakes. At The Cracker Box, they’re huge and an order of two will fill most folks I know. As for lunch, expect to get a great hamburger or try the Nibbler, a plate of fried shrimp, crab cake, fried catfish, hushpuppies and fries. 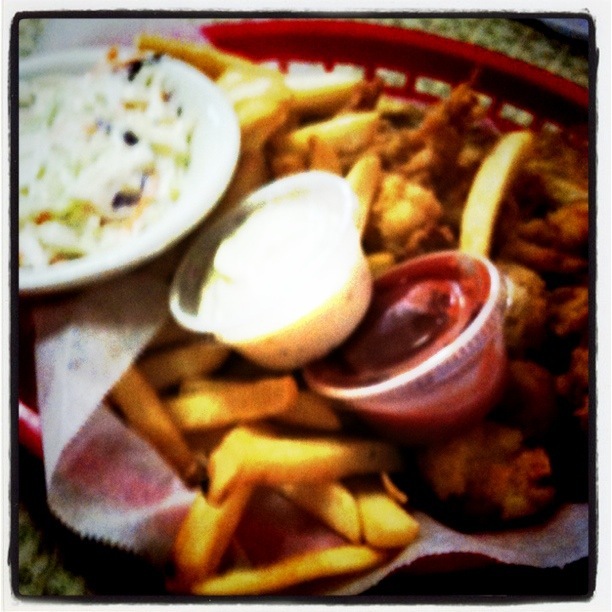 The 'Nibbler' is much more than a nibble at Trenton's Cracker Box Restaurant. Catfish, shrimp, a crab cake, fries, hushpuppies and slaw!!! The Cracker Box’s daily specials are excellent, too. Today it was fried mullet or fried quail, served with fries and swamp cabbage!